Up at 7 am and packing again. We really do have the get-out-the-door to catch a bus, train or plane thing down pat these days. Given that we were on the 4th floor of the building with only stairs, we had to allow enough time to get all our gear, plus kids, down the stairs and out the front of the building to wait for the man to collect our keys. He arrived not long after 8.30 am and was quite congenial – maybe he had checked his email and realised after all that I had emailed him and received a reply from someone in his office! Anyway, he was happy enough to call a taxi for us, much easier than us trying to attempt to get our message across. 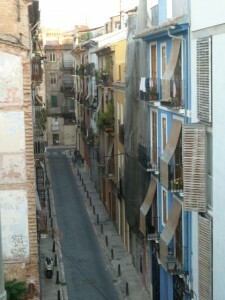 The street view from our apartment. Taxi arrived shortly after and off to the station to catch our 10 am train to Barcelona. We arrived early and had enough time to walk around; figure out the system and a few toilet stops. Lucky I have kept a couple of rolls of toilet paper because once again none of the cubicles in the women’s toilets had paper. I didn’t have to understand every word of Spanish that was being spoken, by the women in the ‘aseos’ (bathroom), to work out that they were lamenting the lack of ‘papeleria’ aka paper. Like a good girl scout I was prepared! I did offer my paper to a few grateful women. Train arrived, on we got and off we went. Again, nice comfy chairs; watched a Bruce Willis movie in Spanish with Spanish subtitles and ate our prepared picnic on the way. I have no idea what the movie was called, but I can say that I don’t think seeing it in English would have made it any better! For some reason the toilets on trains are really quite pleasant with paper, soap and even smell good; really the basics you would expect. I just can’t understand why the station toilets are not equally as well maintained. The train from Valencia to Barcelona runs along the coast for much of the way and it is a beautiful ride. Orange groves quickly disappear and give way to gorgeous beaches, golf courses, resorts and fancy apartment complexes lining the route. The train stops at many quaint little towns, much nicer than the ride from Granada. This was a much shorter ride today than Granada as well; only 4 hours as opposed to nearly 10! We got into Barcelona not long before 2 pm and set off to find our youth hostel that was located only 100 metres from Las Ramblas, the most popular and touristed street in the whole of Barcelona. For the next 4 nights we would ‘live’ at the youth hostel; our final stop in Spain. We were keen to make the most of our time here in Spain. After Spain we only had another 4 nights in London before starting our final leg of travel in North America. Spain was an adventure in accommodation as we used a multitude of accommodation options including a long stay apartment rental; short term apartment rental; hotel and youth hostel. Upon arrival in our apartment in Marbella, we quickly had some concerns about the maintenance of the apartment e.g. there was red crayon on the wall near the front door; light bulbs needed replacing; the drier had so much lint in it I could have made a felt hat, plus there was a load of wet towels sitting in there that had not been dried; both showers squirted water everywhere; one shower didn’t even have a curtain … the list went on. So I compiled a list of concerns and when mentioned to the manageress she was less than concerned and in fact fobbed me off, even when I told her our clothes were stuck in the washing machine and the door to the balcony didn’t lock properly. Her response was that someone would look at the machine later and that she happened to know that the owner of the apartment next door was in it at the moment and they were not likely to climb over the balcony and break in! Gee, thanks I feel better! At this point I wondered whether I should email the owners, as I had their address, but I decided I didn’t want to whinge. We did get our washing out of the machine and a shower curtain and lightbulbs appeared but overall things did not get much better. The washing machine still wasn’t working as it should and one day the washing did get totally stuck. The door finally opened and our washing rescued. It was obvious by the marks on the door that other people before us had experienced the same issues and tried to prise open the door. We informed the manageress again that the machine was now in fact not suitable to use and that it needed to be fixed asap so we could wash. Steve headed off to Gibraltar that Friday and left me with the problem. After returning from a day out on Saturday afternoon I was greeted by an email from the manager informing me that they were able to fix the washing machine handle whilst I was out. Quick inspection, yes the handle did look new; but they were charging us 50 Euro for the repair since they were saying the handle had only just been fixed prior to us renting the apartment. What the ?? You can imagine my rage. I did not respond to their email and chose to email the owner instead, complete with a list of my concerns. Thinking that wasn’t good enough I sent a second email to the owner, this time with photographic evidence of my concerns. He replied that they were most shocked to see the state of the apartment and did not wish to charge us the 50 Euro. Hooray. I was feeling better. That is until a day ago when Steve checked our credit card statement and we saw we had in fact been charged the 50 Euro. I am currently awaiting a reply from the owner on this matter. Watch this space because I might just have to go public with the name of the apartment management firm – Name and Shame I say because other innocent people may suffer the same fate as us if they continue to bill people for general wear and tear. If you rent a long-stay apartment then I would encourage you to record and photograph any concerns that you have and email them to management as soon as you arrive so that you do not get a surprise bill for something that was an exisiting problem. If the owner of the apartment reads my website then please email me asap! Gracias. Back to Barcelona … read the upcoming posts on our adventures in busy Barcelona. Happy Birthday Karina – Glad to have spoken to you today – while you’re in London! HAVE FUN! Love Simone and Co.